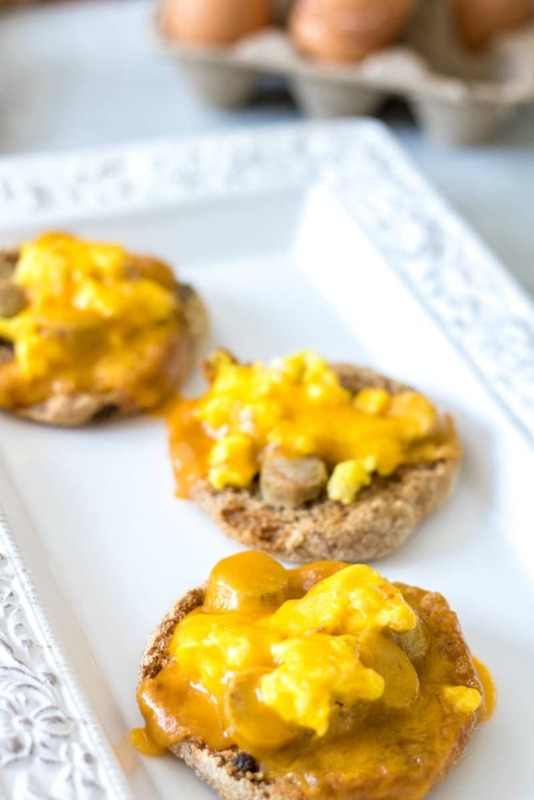 These easy, mini breakfast pizzas are made with English muffins, breakfast sausage scrambled eggs, and cheddar cheese. This simple breakfast pizza is a perfect go-to breakfast any day of the week. If your family is anything like my family, you love breakfast!! And when you can combine breakfast favorites like eggs, sausage and toast a pizza concept–magic happens. This mini breakfast pizzas could not be easier or more delicious and make a perfect weekday or weekend breakfast option. 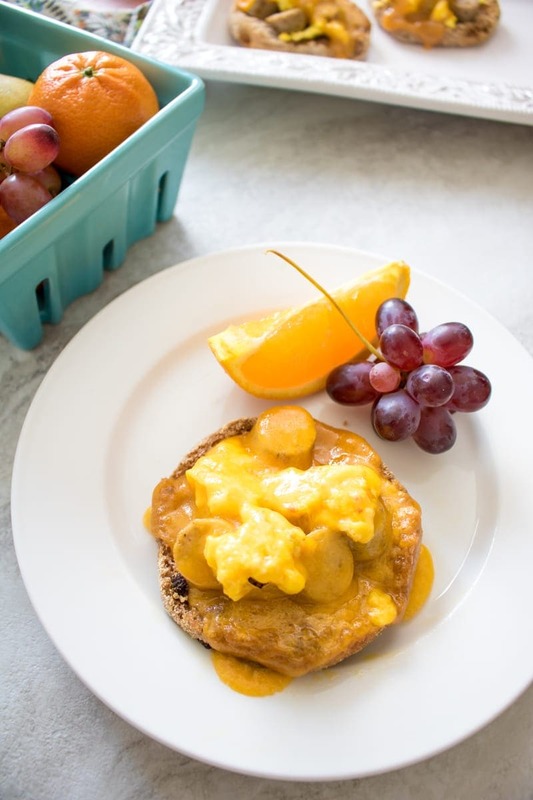 This English Muffin Breakfast Pizza is a bit sweet and savory and filled with protein, whole grains, and healthy fats to keep you energized and sharp to face your day. I love to use Cinnamon Raisin English Muffins for a sweet and savory breakfast pizza. You can also make one large breakfast pizza and use pizza crust instead of English muffins. I recommend a sweet maple sausage for this recipe. Ground sausage or sliced sausage links both work for breakfast pizza. Sharp cheddar is best for flavor, but any cheese you have will work for breakfast pizza. Melt the butter in a nonstick skillet over medium heat. Add in sausage and brown on both sides. Remove sausage from skillet and slice into 1/2″ slices. Whisk together the eggs with milk and a bit of salt and pepper. Add the eggs to the same skillet you browned sausage in and cook, stirring lightly as the eggs set up. Cook the eggs for about 5 minutes, until set but slightly under cooked. While the eggs are cooking, toast the muffins lightly (about a minute or two) in the broiler. Top each English muffin half sliced sausage, scrambled eggs, and shredded cheese. Broil the pizzas until the cheese is melted and slightly golden–anywhere from 2-5 minutes depending on the power of your broiler. Start by heating your broiler to high. While the broiler is heating, melt the butter in a nonstick skillet over medium heat. Add in sausage and brown on both sides, remove sausge from skillet and slice into 1/2" slices. Whisk together the eggs with milk and a bit of salt and pepper. Add the eggs to the same sklllet you browned sausage in and cook, stirring lightly as the eggs set up. Cook the eggs for about 5 minutes, until set but slightly under cooked. Lay out the English muffins halves. Top each half sliced sausage, scrambled eggs, and shredded cheese. Broil the pizzas until the cheese is melted and slightly golden--anywhere from 2-5 minutes depending on the power of your broiler. Great idea for a satisfying breakfast. Love the idea of cutting down on fats by using the chicken and apple sausage and you won me over with the topping of Gruyere cheese. Yum! Thanks for sharing on What’d You Do This Weekend. This is a stellar combo for breakfast. Lower in fat, but still high on flavor! Hope you enjoy Linda!! I hope you make these asap and feel satisfied all morning. These are great Sweet and Savory Breakfast Pizzas, perfect for a weekend crowd! Hope you have a great weekend and thank you so much for sharing with Full Plate Thursday! Yes Miz Helen–these pizza would be sure to please everyone!! Those look so good and easy to make for breakfast or really anytime for the kids. Thanks for linking up to our Bloggers Brags Weekly Pinterest Party. I am making you my Featured Blogger for this upcoming week. I can’t wait to see what you post this upcoming week. Misty…thank you so much! I truly appreciate your shout out to me!! I can’t relate–I LOVE breakfast. So I am happy to share my ideas with you. And I bet your kids would love this. Totally with you on that! I love me some breakfast! My son loves English muffin pizzas and loves scrambled eggs, so I know he would love this recipe! We’ll have to try it this weekend.